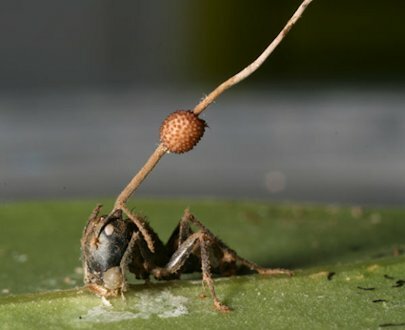 This ant in the photograph on the right has been infected by Cordyceps unilateralis, which is but one of thousands of species of entomopathogenic fungi, more than 400 of which belong to the Cordyceps genus. Between them, these parasitic fungi infect at least nine different orders of arthropods, including the Odonata (dragonflies and damselflies), Blattaria (cockroaches), Hemiptera (aphids, cicadas and leafhoppers), Coleoptera (beetles), Phasmida (stick insects), Hymenoptera (ants, bees and wasps), and Lepidoptera (butterflies and moths). The host range of an individual species is, however, restricted to one species or to a small number of closely related species.